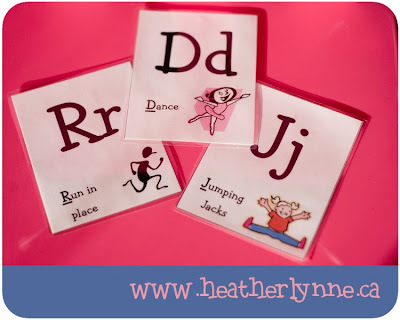 I found these alphabet movement cards at The Home Teacher's Blog. I just printed them, cut them with my scrapbooking paper cutter and then laminated them so that they won't get worn out. It's a free printout, so go get some for yourself if you like them! Wow! These are great. They would be wonderful at our preschool. I'm looking forward to reading more. Thanks for stopping by my blog. I'll finish the Costa Rica post tomorrow.